A powerful smell hit me as I entered Gaza a fortnight ago. Not the smell of burning tyres from the ongoing protests, or the tear gas that has been used in response, but the smell of raw sewage. As I walked the few hundred meters through the wire cage corridor from the Israeli border security across the ‘access restricted area’ to the Palestinian border control, I crossed over a small stream of sewage slowly oozing from the Gaza Strip, under the huge turreted border wall, into Israel. Well, a bunch of reasons. Without sufficient electricity or fuel, sewage treatment plants cannot function. What is left of the sanitation infrastructure that wasn’t destroyed by the last Gaza war in 2014, was designed for far fewer people than are now living in this small enclave. Expansion, operation and maintenance is difficult when there are multiple and severe Israeli restrictions on goods, including spare parts, entering Gaza. The financial resources available for authorities responsible for sanitation in Gaza are woefully inadequate. If people only had to cope with the smell of sewage and a collapsing sanitation system, perhaps life in Gaza would still be bearable. However, many people I met didn’t even refer to the sewage problem – there were too many other challenges to talk about. More than 96% of water from the coastal aquifer where Gaza gets most of its water is undrinkable due to salinity. To access clean water, people often have to pay private water truckers who distribute water from small desalination plants – this costs six times as much as the regular water supply. Part of Oxfam’s work in Gaza involves providing safe water by rehabilitating damaged water systems, but the task is ongoing. Electricity has been a problem in Gaza for many years, but now it is out for 20 hours a day. This could be dismissed as an inconvenience but just imagine the stress and frustration of having to live without lights, refrigeration, access to the internet, or elevators in apartment buildings, let alone the far more serious disruption to hospitals, clinics, schools and water and sanitation services. I was struck that the streets were so much emptier than when I was last in Gaza five years ago. I was told that this was because those who have cars couldn’t afford fuel and anyway people didn’t have enough money to go out for shopping beyond the basics. The Economist has estimated that people in Gaza are 25 per cent poorer today than they were at the time of the Oslo Accords, 25 years ago. 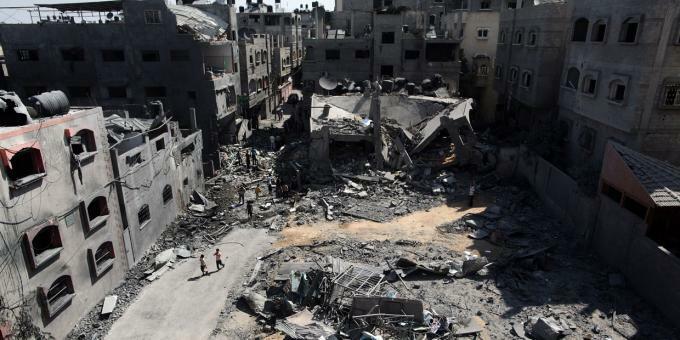 More than 80% of the two million people in Gaza are currently receiving humanitarian assistance. I spoke to parents whose children are recent university graduates but they are sitting around at home getting more and more frustrated. According to the World Bank, unemployment in Gaza is at 44% – for those below 29 years, it is at a staggering 60%. Oxfam is working with local partners to help people have better access to livelihoods, and with local farmers and producers to improve the quality of their produce and help them get it to market to improve their incomes. I spoke to the owner of a dairy processing unit that Oxfam has supported as part of its work to improve the dairy sector across Gaza. I was told that the years of occupation, wars and blockade, combined with a new low in the economic and humanitarian situation in recent months, has meant that this is ‘now the worst time in our history’. The level of despair and the lack of hope in the future was also striking in many of the conversations I had, and was much more pronounced than on my previous visits. As a result, I wasn’t surprised to learn that United Nations medical staff have recently referred to an ‘epidemic of psycho-social conditions’ in Gaza. The people I spoke to shared with me their anger that the world is doing nothing to help them. I was told that even when help does come it is only in the form of insufficient albeit needed humanitarian assistance, rather than a resolution to the conflict, the end to the protracted occupation, the end to the illegal blockade of Gaza and having their right to self-determination fulfilled which is what people in Gaza really want. Human rights organisations in Gaza told me of their exasperation that the Government of Israel and other parties to the conflict are not held to account under international law by the international community. People I spoke to explained that because of this apparent impunity and the lack of alternative options, and despite the large number of deaths and injuries, they were generally supportive of the current protests continuing. Some specified that they would only support non-violent demonstrations. I was told that ‘people in Gaza are doing their best to survive’ but that, despite this, ‘Gaza is dying in front of everybody’. •The blockade – now in place for more than a decade – has devastated Gaza’s economy, left most people unable to leave Gaza, restricted people from essential services such as healthcare and education, and cut Palestinians off from each other. Israel must end the blockade on Gaza, which is collectively punishing an entire civilian population. •There must be a long-term solution to the crisis. The international community needs to redouble efforts to achieve a just and lasting peace based on international law, that brings security and development to all Palestinians and Israelis. •Oxfam condemns the deaths and injuries of unarmed Palestinian protesters in Gaza. Unarmed Palestinians have the right to make their voices heard and the right to freedom of assembly and expression. Israel must abide by its obligations under international law to protect life and exercise the utmost restraint in accordance with law-enforcement standards on the use of force. ◦According to OCHA, 104 Palestinians, including twelve children, have been killed by Israeli forces during the course of the Gaza demonstrations since March 30. As of May 14, the latest rounds of protests at Gaza border resulted in 60 fatalities (including 8 children) and 2,770 injuries as a result of live fire. The number of injuries since the beginning of the protests has been 12,600. Fifty-five per cent of these have required hospitalisation. One Israeli soldier was also lightly injured. This entry posted by Tim Holmes, Program Portfolio Manager at Oxfam GB, on 23 May 2018.